Alright…it’s the moment you’ve all been waiting for! 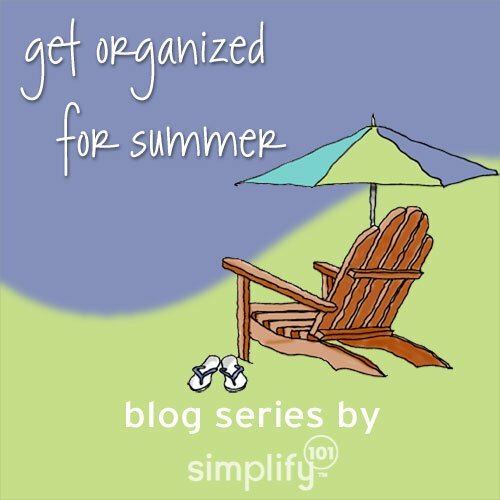 Its time for some reader Q + A posts about getting organized for the summer. This first batch of questions is related to finding balance in the summer, such as how to fit projects in around camps and vacations, and how to organize and prioritize your time to be more productive during the summer…when all you really feel like doing is laying on the beach. My son attends day camp for about 4 weeks of the summer; we do a family trip for about 3 weeks of the summer. My question is, I’d love to get some projects done while my son is in summer camp (9-3 like school hours). It seems like a “bonus” time that I should use for projects like: house projects like hiring painters or roofers or landscapers; cleaning out attic; gardening; doing a big clean-up of our office (we have a small business). Course most of that does not sound fun. How do I organize/prioritize my time to be more productive during the summer when I’m really just dreaming of lying on the beach! I’m with Yvette. Planning family time and work time while the kiddos are occupied, and working a vaca or two in there. I guess I’d better get my calendar and a notepad first! What these questions really boil down to is finding the balance between having fun and getting things done. The posts leading up to this one were designed to help you lay the foundation for figuring out how to balance the fun stuff with the get-it-done stuff. First, you started with your vision for the summer. The idea behind that was to tap into what you really want. What sounds like fun? What do you want and need this summer? Next, you started creating a plan by recording the scheduled summer events and activities on your calendar. These scheduled events will lay the foundation for your summer plans. Around this foundation you’ll fill in with fun stuff and stuff you want and / or need to get done. Now conventional wisdom would be to schedule in your “get it done” stuff before anything fun. But, here’s another perspective. Your to-do list will always have something on it — all of our to-do lists will. That’s the sign of living full and productive lives. So it’s important to put fun first by making sure it has an important spot on your schedule. Fun is as essential as food and air. We don’t feel guilty about eating and breathing…so what if we decide not to feel guilty about doing fun stuff, too? Fun isn’t something we earn the right to after getting everything else done. Instead, fun makes everything else better and easier to do. So, if you need a few days at the beach to relax and unwind, feed that craving. Recharge your batteries with a little rest and relaxation so you can enjoy the summer and feel better about your to-do list. Pull out your calendar where you recorded your scheduled events and activities. Where can you schedule in some time to relax and recharge…either at the beach or doing some other fun and restorative activity for your summer fun list? Stake a claim to some time for fun, and then schedule in some to-do list items. By scheduling some fun stuff, you’ll feel your energy shift. You’ll look at your to-do list in a new way, when you know that your needs for fun and relaxation will be met. On an ongoing basis, you can use a similar approach, filling in your available time (after work and around scheduled activities, for example) bouncing back and forth between fun stuff and to-do list stuff. For example, you could carve out mornings as a time to get things done, leaving the afternoons for fun. Or you could have a get things done day (or two or three) followed by some fun days. 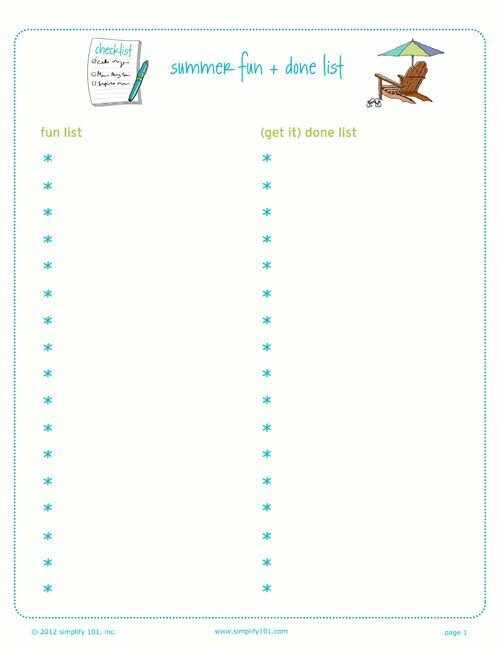 I’ve put together one more summer form (summer fun + done list) to reinforce this idea of balancing having fun and getting things done. The left side of the list is for “summer fun” stuff. Use the ideas you generated in this post and write down a few of your favorite ideas on the left side of the summer fun + done list. Then, on the right side, list out the things you want or need to get done this summer. Make it a goal use both sides of the list! As you see the list fill up with check marks on both sides, you’ll be reminded that you are having fun and getting things done. What are some tips for working from home with children? Aby, how do you divvy up your time? Spend some daytime with them and work more at night after they are in bed, etc? Do you recommend having a home office or working “around the house” so you can multitask at home with kids and be where they are playing? I love this question because I think it really gets to the core of the dilemma for many Moms during the summer. Whether the work you’re trying to do while the kids are at home is for paid employment or for your family, it’s hard to work and not work at the same time. Yet so often, that’s what we try to do. What I have found is that crisp boundaries work best for me. And that’s what makes summer so tough: the boundaries get really, really fuzzy. So even though I have set work hours, I have to do some Mom stuff during those hours like taking my kids to camps or friends houses or the pool. When my kids were younger, it worked best for us when they went to summer day camp during my working hours. This allowed me to maintain those crisp boundaries—work hours were while they were at camp; family hours were while the kids were at home. As they got older, they wanted to be at home during the summer so they could play with friends and enjoy the wind-down aspects of summer. I have to admit I resisted this because it meant they had to find ways to entertain themselves during our work hours. A great deal of what I do for a living is write—which requires quiet time alone behind a closed door where I can think. This isn’t something I can do sitting in the same room as my kids…because then they’ll want to talk to me and I’ll want to talk to them…which means I can’t write. So, I have set work hours in my office where I’m basically off limits unless there is an emergency. This is where day camps, over-night camps and other self-directed activities from the summer fun list come into play. Is it ideal? No, not really. But here’s the thing, if I worked outside of my home for as many hours a week as I do now, the situation would be exactly the same. When they weren’t old enough to supervise themselves, they would have gone to day camp. And when they were old enough to be home alone, they would have stayed home alone for the summer. Our current arrangement allows the kids to be at home, play with neighborhood friends, go to summer camps, and eat three meals a day with their family. Plus, we have evenings and weekends to do fun stuff together. Now what if your kids aren’t old enough to take care of themselves while you work? Then, I would take a hard look at your work to-do list. Are there things you can you do while supervising your kids? How much of your to-do list requires solitude or quiet, concentration time? From there you can set your working hours. Perhaps you could work for a few hours while watching your kids and then schedule a second daily work session for after your kids go to bed. Or maybe you could set your work hours for in the evening while your spouse takes care of the kids. You may discover that you need to arrange for some outside childcare to give yourself enough time (and the right kind of time) to get your work done. But, it’s certainly better to know this ahead of time and plan accordingly. Once you answer these questions, then you can answer the question about setting up your work area. If you have tasks on your to-do list that can be done in various locations with the company of your kids, then setting up a flexible, portable work station is a great idea. However, as a general rule of thumb, I have found that doing work in an area dedicated to work makes it easier to keep those crisp boundaries intact. You know when you’re at work because you’re in your office and you know that when your aren’t in your office, it’s time to focus on your family. What works for you? What tips do you have for striking the balance between work and family and work and play during the summer? I’d love to hear from you! I always was considering this subject and inventory still am, thank you for posting. Thank you for answering my question- I was so thrilled to see it up here. You would be proud of me, my husband and re-arranged our office stuff, and created a workspace in our den with both of our desks, and fun accessories, all free to us, just shopped from our own house. I am already loving my new workspace and think it will be a great place to focus when I work, and play when I’m not. I am thinking of some outside childcare, too, every once and awhile. Great suggestions and I love this summer theme! Thanks so much Jessica! I’m glad you’re enjoying the series. Thanks again for your question.